Have you learned of the death of someone's family member or close friend? Do you find yourself at a loss for words when you try to think of how to show your condolences? You're not alone. Writing your thoughts during this time of grief and mourning can be stressful. One of the most difficult messages to write is one that expresses sympathy to someone who has lost a loved one, whether it’s a family member, friend, or a beloved pet. However, there are times when it’s simply the right thing to do, and you need to rise to the occasion. Keep in mind that the person receiving it is not evaluating your writing style or even thinking about you during this time. The purpose of the card is to provide comfort to the person on the receiving end. 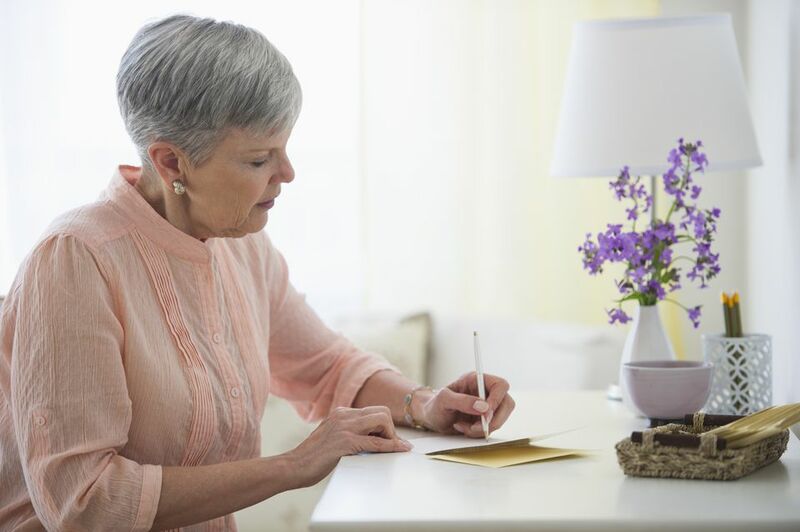 Take the time to write and send the card as soon as possible after you hear the news of the person’s loss. This note is more personal if it is handwritten. It's best to handwrite your sympathy note and put it in the mail rather than send it via email. You may include a thoughtful sympathy gift along with your note, though it isn't a requirement. Find a nice card or use your best stationery and write with a pen. Start by jotting the note on a practice piece of paper before putting the words on the final card. You don't have to write pages and pages; your note can be brief, as long as it's heartfelt. When you write a sympathy message, remember that it doesn’t have to be some long tome that rambles on and on about the deceased. You shouldn't try to offer any explanations about why the person passed away. The key point is to let the receiver know that you are thinking of him or her and that you care enough to send the card. The message can be a simple one-sentence expression of sympathy, like “I am sorry to hear about the loss of your uncle.” This may be used for someone you don’t know very well, such as a business associate or acquaintance. For someone you know well, perhaps you may want to add a memory about the deceased. Don’t be afraid to mention a happy or funny moment. The recipient will appreciate a smile through the tears at the reminder of a special moment in the loved one’s life. If the loved one died in a tragedy such as a car accident, the person will likely still be in shock. Keep this note short, but offer to do something specific to help out. And then follow through. Let the person know that he or she is in your thoughts and prayers. If you feel that the person may not want to be prayed for, you can omit mentioning the prayers. Even if you choose to pray for the person, remember that this is about the person you’re sending the card to—not about you. Close the note with an offer of help. This can be the delivery of a meal, letting the person know you’re available for a chat over coffee, or the willingness to help with a chore. You can be specific about what you can do, or you can simply offer to be there for whatever the grieving person needs. There are some things you should never write in a sympathy card. Avoid the temptation to add meaningless clichés such as, “He’s in a better place now.” This isn’t likely to make the recipient feel any better and may actually evoke a negative reaction. The person suffering the loss is hurting and doesn’t need to read this type of comment. Don’t tell the person you know how he or she is feeling. If you have experienced a similar grief, he or she probably knows and doesn’t need to be reminded at this time of sorrow. If you haven’t gone through this, you will come across as insensitive. I’m sorry to hear about the passing of your uncle. He was always the life of the party, bringing smiles to everyone he encountered. I’ll never forget the time he had everyone in stitches playing the kazoo at your birthday party. I’m sure those happy times will be missed by everyone who knew him. I want you to know that you and your family are in my thoughts and prayers during this difficult time. If you need anything, don’t hesitate to ask. Or if you simply need someone to listen, call me any time. I’m available to babysit next weekend if you and your husband would like some time to yourselves. I was deeply saddened to hear about your grandfather's passing. I know you were very close to him and will miss him very much. You're in my thoughts as you travel to Texas to his funeral. If you need someone to check on your house or bring in your mail, let me know. I'll be glad to help in any way I can.